Once you’ve created the animation in the Animation Editor, you can then output it by choosing Animation output from the Output Panel. Below are all the output settings for Animation. 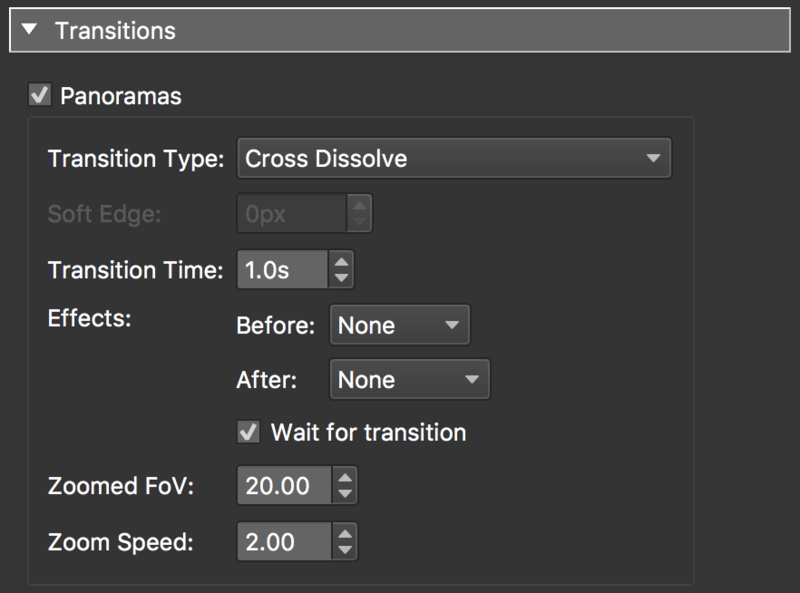 If your Animation has multiple clips, you can chose a transition for moving between them. Select this to enable transitions. Soft Edge – Depending on the type of transition selected, you’ll be able to apply a soft edge (feather) to the transition. For example, applying a soft edge to either Iris transition, will soften its edge when moving between the two panoramas. ✭ Tip: Use a low value of 30px, for instance, for a subtle blur that looks like motion blur. Or try a high value of 300px for a very soft transition. These are the movie settings. You can choose to output just a movie file or just an image sequence (frames) or both. Sequence – Choose a sequence, that’s been created in the Animation Properties, to output. 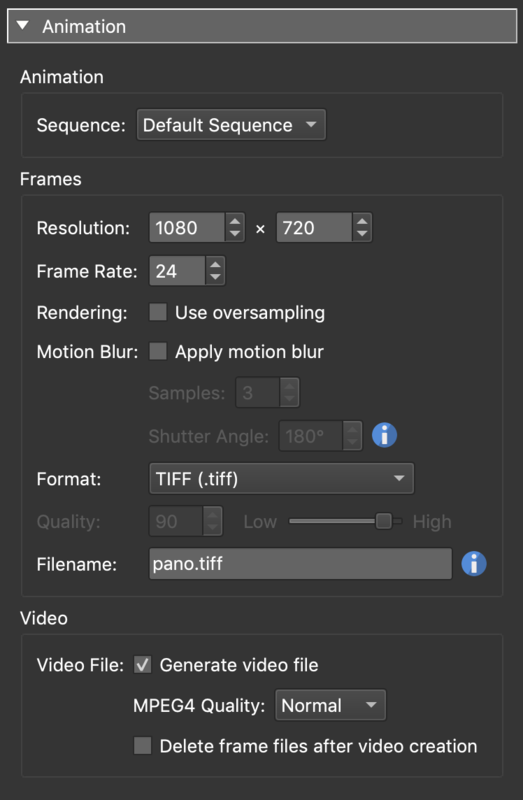 Resolution – Define the movie’s resolution (width x height in pixels). Frame Rate – Define the movie’s frame rate. A frame rate of 60 will produce smooth results. Motion blur – Select Apply motion blur to apply motion blur to the video which will help to produce a smooth motion in the video. Samples - Determine the number of samples to create. 3 is the default and should work well with most projects. Shutter Angle - This will determine how much motion is recorded in each frame. The default is 180º and is a common setting. A larger angle would create more blur to point of smearing while a smaller angle would create a more stuttered motion. Video file – Select Generate video file to enable the video file output. ✭ Note: To generate a video file, you must have FFmpeg installed. Learn more. Delete frame files after video creation - In order for the video to be created, each frame must first be generated. Select this option to delete the frames after the render is complete. It might be useful, however, to keep them if re-rendering is a possibility. Format – Select the file format of the frames. Quality – If you choose JPEG as the frame format, then select the quality of the JPEG. Filename – This is the filename for the frames. By default they are named pano and will count up through the sequence, but you can change this to anything you prefer. All frames - This option renders all of the frames in the project. This means all clips will be rendered. Clip - Select a specific clip to render. Only this clip will be outputted. Frame, Time or Timecode - Define a range to output. You can output a range of frames, time in minutes and seconds (MM:SS) or in Timecode (MM:SS:FF). Click Render to create the output. ✭ Once the clip or clips have been outputted, you can select which ones to view when you click the Open Output button.